Is HBO About To Cut Its Prices? HBO is often touted as the gold standard among cable channels, but as it turns out, the company’s pricing plan may not be competing quite so adequately. In recent weeks, the subscription cable channel has been sending out surveys, tentatively asking users if a different price point would make HBO a more compelling buy. Currently, HBO costs roughly around $14.99 a month, with HBO Now costing right at that mark but some cable services offering an HBO package for cheaper. Speaking of HBO Now, users who signed up for HBO Now but dropped the streaming service after one month have been receiving an opportunity to fill out a customer satisfaction survey. The survey states HBO is trying to “better understand” the customer’s HBO Now experience. 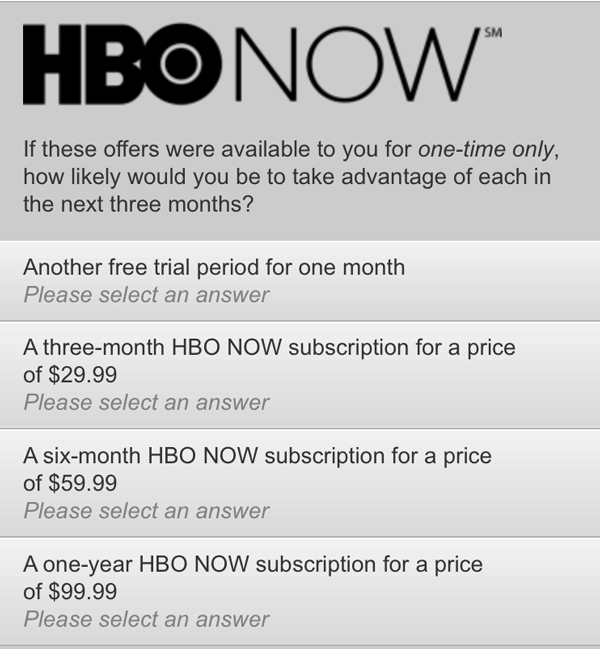 According to Cut Cable Today, the survey asked HBO Now droppers how they would respond if different packages were made available, including a three-month deal for $29.99, another free trial of HBO Now and so on and so forth. The move comes just a short time after HBO released HBO Now just in time for the Season 5 release of Game of Thrones. Getting HBO Now has been a more complex process than expected thanks to the Apple TV deal, although traditional HBO is currently still available through other platforms, like cable and Sling TV. HBO has been costly for subscribers for years, but the survey seems to indicate the subscription cable service and its streaming component may not be able to keep up with the cost of other major players in the streaming industry, including Netflix, Hulu and Amazon TV. Currently, Netflix costs subscribers $8.99 per month and Amazon Prime costs users $99 per year, but includes a host of benefits not related to streaming television. Hulu comes in at the lowest price point, with paid subscribers only shelling out $7.99 a month for the service. All three of these services cost well under what HBO requires users to shell out for its catalog of dramas, comedies and documentaries each month. If HBO were to cut back on costs, the service might lose more money in the short run, but if that would entice more subscribers to sign up, it could add to the overall value of the subscription service. Still, it’s a gamble, and HBO seems to be sending out feelers to see if the company can pull it off. HBO has a lot of great programming in its catalog. Recently, the channel has seen new episodes of Game of Thrones, Veep and Silicon Valley, not to mention the network has housed the documentaries Going Clear and Kurt Cobain: Montage of Heck. Plus, HBO Now and Go presents users with an entire backlog of programming that includes critically acclaimed dramas like The Sopranos and The Wire. It’s clear a lot of people are willing to shell out for those programs, but it’s equally clear that HBO is looking for ways to get its service into more homes. Would you become a subscriber if the prices change?